Seven Hills community is an affluent 1,300 acre subsection of Henderson, Nevada. As an exclusive community with 25 distinct neighborhoods, Seven Hills is home to the founder of eBay Pierre Omidyar, Mike Tyson and others. 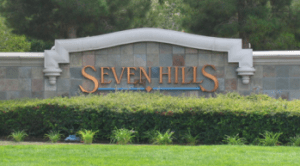 Seven Hills real estate is approximately 7 miles (11 km) from the Las Vegas Strip and has approximately 2,900 homes and condos. It is home to Revere Golf Club and The Rio Golf Course. Seven Hills homes for sale are located half of a mile east of the Henderson Executive Airport, which is mostly known for private jet business. Seven Hills homes for sale neighborhoods reside on the top of the McCullough Mountain Range overlooking the city of Las Vegas. A great view is pretty easy to have with just about any home in this great neighborhood. Zip code for Seven Hills real estate is 89052.